To some, enjoying a delicious sandwich is a great way to relax. Others may prefer an afternoon unwinding at the beach. Perhaps the ideal getaway is being able to enjoy one's favorite sandwich on a beach. 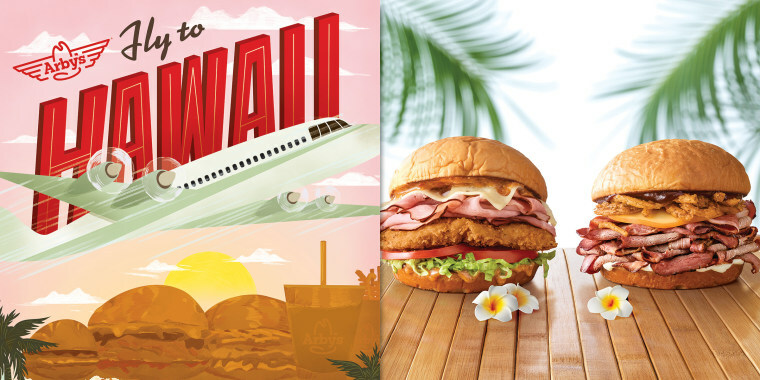 On Friday, Arby’s enticed beach-loving sandwich fans with the chance to win a vacation to Hawaii ... for only $6! However, there’s a very big catch because, of course: The entire trip will be just one day. Yup, you read that right. Ticket holders will be eligible for less than 24 hours of fun in the sun in the Aloha State. But, we repeat, there will be sandwiches. In promotion of its new sandwich line featuring meat stacked on King’s Hawaiian rolls, the fast food chain is launching Arby’s $6 Hawaiian Getaway: The sale started on Friday at 12 p.m. ET. Tickets were available on a first-come, first-serve basis — and, unsurprisingly, they sold out about as fast as that viral Olive Garden Pasta Pass. Some folks were adverse to the idea of that short a trip, seeing as how the majority of contenders likely don't live in Los Angeles, which is where the flight will take off from. This is nuts! Sit on a plane for 10-12 hours round trip just to eat a sandwich in Hawaii? No time at all for site seeing or soaking up a bit of Hawaiian culture? Count me out. Those who were excited were quickly let down when the site sold out in what some claimed to be less than a second. They sold out fast! We will be dropping more tickets on Monday. Luckily, Arby's tweeted it would sell more tickets Monday, April 15 — adding to the list of popular Tax Day food freebies! TODAY Food reached out for specifics, but did not hear back as of Friday afternoon. So what do you get if you actually win? The winners (well, buyers) will all fly to Hawaii together on April 27. Once they land in Honolulu, travelers will board a bus filled with sandwiches like Arby's Spicy Luau Chicken and Smokehouse Brisket. Then everyone will be dropped off on a beach to relax in the sun and sand. Then they'll fly back to the mainland on the same day. No sleeping over, no waking up in paradise ... just plenty of sandwiches. Ten people total (unless they make room for more Monday) will win this opportunity and the $6 ticket is good for just one person, so if you're trying to fly with a friend, make sure they have access to a computer on Friday at noon. Fast food debate: Do you know what Arby's name really means? But why $6? The low price tag simply celebrates how much one of the new sandwiches costs. While Arby's vacation offer takes the phrase "quick jaunt" to new extremes, we're sure the 10 lucky travelers will have a delicious time.